Today is the first day of October! I can't believe how fast this year has gone by. Now that it's October I am in the Halloween spirit! Halloween was always an interesting holiday for me. Up until about fifth grade every year on Halloween my little sister or I would get sick and end up throwing up in someone's yard before the night was over bringing the trick or treating to an end. Although I was always sick I did dress up every year and I have some fun pictures to share! In 2009 (and the two years before that) I was obsessed with Fancy Nancy and dressed up as her in the same exact costume all three years! Christmas of 2009 I received my first American Girl Doll, Julie so by Halloween of 2010 (I think I was in fourth grade) I was so crazy about my doll I dressed up as her! I even wore the awful Hannah Montana wig to school! In 2011 my little sister and I had just started showing pigs and loved them so much we both dressed up as Miss Piggy. 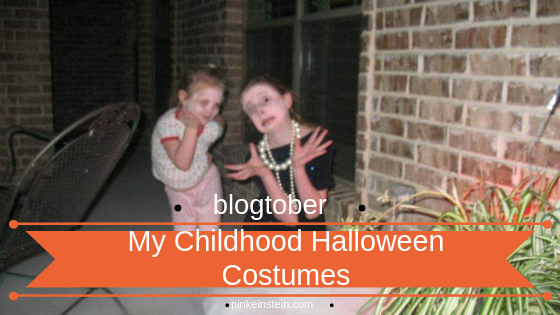 We wore pink face paint, I wore one of my mom's high school formal dresses and a ton of pearls. 2012 my cousin Jolene (shown in the pictures) had the idea of being a nerd for Halloween and since she was trick or treating with us my sister and I dressed as nerds too. 2013 was the year my dad created the character of Pink Einstein so I went dressed as myself in a hot pink wig and lab coat. So sorry the picture quality is awful ,I can't find any better pictures. 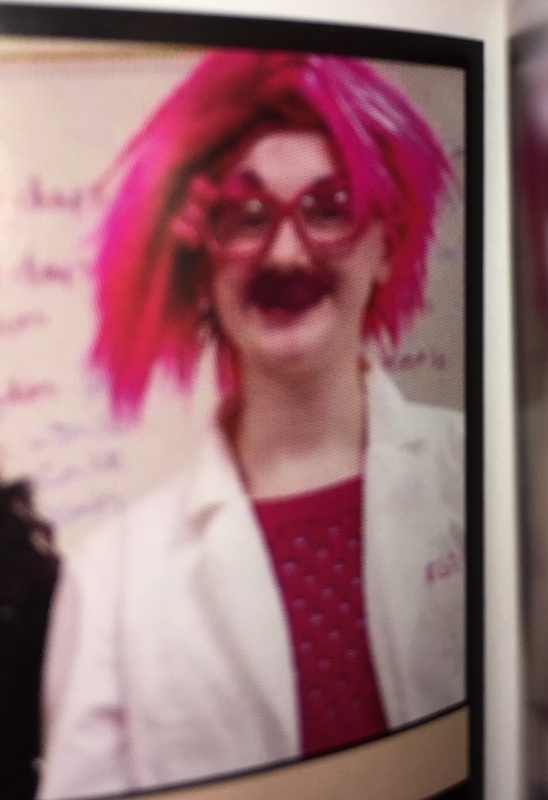 I took this from my seventh grade yearbook! 2014 I went dressed as a pig in a blanket. 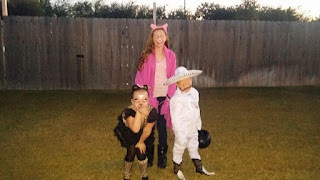 I wore pig ears, a pig nose I made out of a paper towel roll, and a pink blanket. In 2016 my cousin Jolene, my little sister, and I were all obsessed with the Disney cartoon Gravity Falls so for Halloween we did a Gravity Falls group costume. I'm dressed as Mabel, Jolene is Dipper, and my little sister is Pacifica. That same year McCray hosted a Halloween party and for the party I went as a pinata! You can see more pictures from the party in this blog post. So there's a few throwback Halloween pictures! I hope they made you laugh. McCray and I are still not sure what we want to be for Halloween this year but I will share pictures when we finally figure it out.